I urge you to read Carl Nold’s thoughtprovoking essay on the challenges faced by historic house museums in the twenty-first century. House museums need to find ways to be relevant, exciting, and able to compete for the public’s attention in a fractured and media-hyped marketplace. Now that Carl is serving as chair of the American Association of Museums, he will be actively involved in developing solutions to these problems nationwide. Historic New England is indeed fortunate to have at its helm a leader with his vision and experience. Also in this issue, Richard Nylander examines the silhouette of the Appleton family and finds in its details a remarkable trove of evidence—from works of art on display to the textiles and furniture types— that tell us about taste among Boston’s well-to-do in the 1840s. 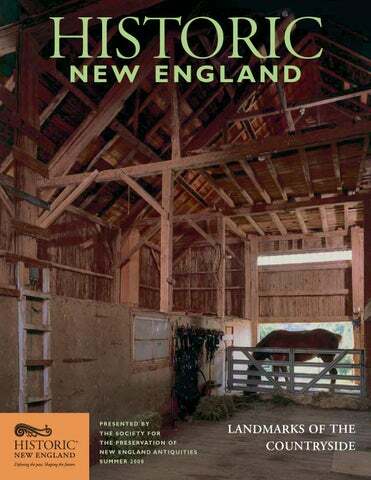 The article reflects the profound understanding of New England material culture that Richard developed during his more than forty years at Historic New England. Although he retired in March, we are ever grateful for his service and hope he will continue to share his insights with us for years to come. Let me remind our members to visit the historic house museums this season and enjoy the numerous events being offered all over the region for everyone interested in experiencing history in ways that are both enjoyable and authentic. The timber-framed barn at Cogswell’s Grant, Essex, Massachusetts. David Bohl. room, decorated with greenery. The wallpaper, still on the walls today, may have been installed to coincide with the celebration. n 1796, upon being ordained minister of the Congregational meetinghouse in Standish, Maine, Daniel Marrett and his bride, Mary, purchased a house that would become home to three generations of their family. The handsome Georgian house in the town center reflected Marrett’s status as a leading citizen in the community. The couple had six children before Mary died in 1810; two years later, Marrett married Dorcas Hastings, who gave birth to eight children. While most members of the family’s sizeable second generation left Standish when they grew up, fond memories of the family home lingered in their minds. As Lorenzo Marrett wrote in 1842 to his younger sister Helen, still living at home, “though I may now be settled on a spot which I trust will bye and bye become a home indeed to me, yet my thoughts will wander back to the old mansion house as long as you and mother shall dwell there.” Clearly, the Marretts had a deep attachment to their family home long before 1889, when Daniel’s son Avery and his wife Elizabeth invited family members to return on August 15th to commemorate the old homestead’s centennial. Their celebration took place in the wake of America’s Centennial festivities, which had unleashed a wave of interest in Colonial arts, architecture, and family history. The Marretts’ Colonial lineage was likely a source of pride for family members, who came to the celebration from as close as Portland and as far as Seattle. In the front yard stood an evergreen arch bearing the dates 1789–1889. Inside, the rooms were festooned with pine branches, and some were redecorated for the occasion. Frances, Avery and Elizabeth’s youngest daughter, recited her poem: Come hither, oh friends of the past and present! Come, and your early acquaintance renew. The old house stands eagerly waiting to greet you With a welcome warm and true. The party continued with music and an elaborate luncheon. Today, with rooms that have scarcely changed since the home’s centennial, Marrett House is a time capsule that reflects the family’s reverence for their history. “In the best style” A recent acquisition sheds new light on elegance in Boston in the 1820s. museum going is most often a social experience, done in pairs or larger groups, less frequently a solitary pastime. Another factor is the changing availability of time for personal and leisure activities in the lives of American families. Increasingly, both parents work outside the home; shopping is now available on previously blue-law-protected Sundays; and parents feel the need for childhood-enhancing soccer games or ballet lessons, not to mention the time required for transporting children to them—all are identified as contributors to a reduction in time previously devoted to museum visits. represent styles that at one time were considered not worth preserving. ABOVE RIGHT Schoolchildren at Pierce House, Dorchester, Massachusetts, the site of numerous educational activities. private collections. This group enjoys a private tour of Philip Johnson’s Glass House, New Canaan, Connecticut. boxed it into a rigid tour, excluded the public from direct involvement with the collections, and tried to impose a single model on what are really very diverse places and constituencies. With continuing dedication to preservation and to the scholarship that helps us understand the past, historic site museums must experiment with new ways to attract and serve audiences. Historic New England is committed to this approach, and recent results are very encouraging. —Carl R. Nold President and CEO Carl R. Nold has more than twenty years’ experience in the history museum field. Formerly director of Mackinac State Historic Parks in Michigan, one of the most-visited systems of history museums in the nation, he currently serves as chairman of the American Association of Museums. During Colonial times, farming was one of the most common occupations in the region, and entire families worked hard to produce food and other goods for themselves and their neighbors. Children helped their parents by gathering eggs, milking cows, and harvesting crops. Do you think youâ&#x20AC;&#x2122;d like to work on a farm ? Life on the Farm Life on a farm follows a familiar cycle based on the seasons. Here is a year of farm work as recorded in the journal of Colonel Samuel Pierce of Dorchester, Massachusetts, in the eighteenth century. Can you solve this puzzle? It comes from a ma gazine for farm families published over one hundred years ago! A farmer had four sons and one hundred acres of land. He reserved one quarter, or 25 acres, in one corner for his own use, as shown in this diagram. The father then told his sons that he would give them the remaining 75 acres of land if they would divide it into four equal lots of the same shape. word scramble Since Colonial times, farms have been an important resource for New Englanders, providing many goods that we need for daily life. See if you can unscramble this list of things produced on farms. Answers can be found on page 12. Directions 1. Put a layer of gravel at the bottom of each pot, and then fill with potting soil. For seeds, make small indentations in the soil. Plant seeds according to the depth and spacing recommended on the packets. For plants, gently transplant the herbs into the new pots and fill in the remaining space with potting soil. 2. Write the names of the herbs on popsicle sticks and insert them into the pots. on the cover of this issue. FAR RIGHT, ABOVE A gable-front barn in New Hampshire, with an impressive cupola. FAR RIGHT, BELOW A twentieth-century gambrel-roofed barn. that was safer in high winds and easier to open in the presence of heavy snow accumulations, debuted in new barns of the mid-nineteenth century. Exterior cosmetic detailing began to appear on new barns, particularly in the pediments and eaves. Such details unified the barn with the style of the farmhouse and other outbuildings and gave the farmstead an appearance of modernization, which was synonymous with excellence. By the 1860s and ‘70s, the most fashionable barns featured Gothic, Italianate, and Second Empire styling. A decade later, gambrel roofs became popular, because they afforded a greater volume of space for the hay loft without an increase in wall height. High-drive bank barns—three, four, or even five stories in height—like the earlier bank barns, took even greater advantage of gravity to make farm labor more efficient. These barns featured an earthen ramp leading to the barn’s loft level. Instead of hoisting the hay into the loft with a hayfork, the farmer could drive up the ramp and offload hay and grain with ease, shifting it into the haymow or to livestock below. High-drive bank barns were wide enough to permit the wagon to turn around at one end of the barn and exit through the same door. covered ramp at the gable end and an additional earthen ramp to the second story at the eave side. An early bank barn, c.1850, in Peacham, Vermont, which is part of the Josiah and Lydia Shedd Farmstead and is listed on the National Register of Historic Places. In 2007, the current owners were awarded a $10,000 Barn Grant towards stabilizing and repairing the structure. THIS PAGE The Lilacs, Thompson Kidder’s country seat in Medford, Massachusetts, was one of many estates, large and small, developed in towns near Boston after the Revolution. These watercolor drawings provide a detailed picture of the unity of ornament and productivity in landscape design around 1808. The main approach to the house features a curved drive and a circular garden, defined by regularly-spaced flowers and shrubs. Simple wooden trellises flank the front entry, and vines twine around the pair of columns to complete the symmetrical composition. The rear tract of land was intensely cultivated with fruit trees and a vegetable garden. Kidder also developed a series of terraces with curvilinear beds in order to maximize the planting area on the steep site. The practical design was balanced with aesthetic touches, such as winding paths and a lattice summer house. scape gardening and domestic architecture, which promoted the interdependence of beauty and usefulness. He described two major types of landscape, the “beautiful”— with serpentine lines, soft grasslands, and groupings of deciduous trees— and the “picturesque”— with irregular lines, rough ground, and pointed evergreens. Downing’s innovative ideals of rural life were superseded as the century progressed. Designers like Frederick Law Olmsted, also influenced by the English landscape tradition, found new ways to integrate nature with decorative elements. Other designers looked to the past for inspiration. Publications such as Alice Morse Earle’s Old-Time Gardens, 1901, and Edith Wharton’s Italian Villas and Their Gardens, 1904, provided models that spawned a rich and eclectic chapter in American garden history. THIS PAGE During the early years of the New Republic, New England’s prospering port towns and cities saw the construction of many high-style residences. Typically, the building lots were narrow but had considerable depth. In contrast to the naturalistic park-like designs found on rural estates, these urban gardens tended to be symmetrical and enclosed. ABOVE This 1812 plan of the garden at the Rundlet-May House in Portsmouth, New Hampshire, depicts the grid design laid out by James Rundlet in 1807. The house was situated on a terraced site, with two acres of gardens, including plant beds, gravel walks, and an orchard. A long shed and stable separated the service yard from the gardens. Rundlet kept detailed records of expenses at his property. Plant purchases made between 1807 and 1809 included pear and peach trees, grapevines, and rose bushes. Subsequent records document the cultivation of asparagus and potatoes. The landscape’s formal arrangement was in keeping with the ordered context of city life. LEFT Two photographs taken c. 1899 depict the Brockway garden in Newburyport, Massachusetts, which dates to the Federal era and shares many similarities with the garden at the Rundlet-May House. Both houses were elevated on grass terraces with fences enclosing the front yards and had deep rear gardens. Each was organized into geometric-shaped beds, but the Brockway garden was of a more complex design than the simple rectilinear forms of James Rundlet’s garden. LEFT A. J. Downing’s theory of the ideal environment—one slightly removed from the urban center—influenced the landscape of the American suburb. In 1856, Boston architect Luther Briggs, Jr., designed a house and grounds in Jamaica Plain, Massachusetts, for grocer Ephraim Merriam. Briggs probably took his inspiration for the Italianate house from one of Downing’s architectural pattern books— either Cottage Residences (1842) or The Architecture of Country Houses (1850). Briggs’s plan for the landscape surrounding the house also reflects Downing’s recommendations in the use of ornamental plantings, fruit trees, and a grape trellis. BELOW Benjamin Rand, a Cambridge, Massachusetts, carriage builder, constructed his Italianate house on a large plot of land in 1855. The extensive grounds, enjoyed by the Rand family for almost one hundred years, included ornamental plantings, a neat vegetable garden, a cutting garden for flowers, and a small orchard. A greenhouse was located in the more utilitarian section, while gravel paths connected the wisteria-covered summer house with other recreational areas. The Rand family’s suburban oasis, photographed c.1890, is now the Porter Square Shopping Center. Beginning in the late nineteenth century, New Englanders increasingly sought the help of professional designers to plan their gardens. Elaborate greenhouses were often included as part of a large professional design. This greenhouse was proposed for the estate of publisher Edwin Ginn of Winchester, Massachusetts. The greenhouse was probably designed by the Irvington, New York, firm of Lord & Burnham. BELOW AND RIGHT “All our roads seem to lead us toward the Hamilton House,” wrote Emily Tyson to her friend, author Sarah Orne Jewett. Located on a high bluff overlooking the Salmon Falls River in South Berwick, Maine, the Georgian house was built about 1788 by prosperous West Indies merchant Jonathan Hamilton. Captivated by the beauty of the house and its evocative setting, Emily Tyson and her step-daughter, Elise, purchased the property and the surrounding one hundred and ten acres in 1898. The Tysons created a series of gardens compatible with the house’s Colonial character, including an elaborate sunken garden surrounded by a vine-covered pergola, a cutting garden enclosed by an arborvitae hedge, and a cottage garden. One of the many garden writers who visited Hamilton House noted, “In isolation, simplicity, and ripeness the atmosphere of the whole place breathes of olden days, and might well be taken as a model for a perfect American garden.” Unfortunately, the pergola and other architectural elements were destroyed by a hurricane in the 1950s. The elms that were planted around the house and along the river bank succumbed to Dutch Elm disease. The cutting garden evolved into a shade garden as the arborvitae hedge grew to be thirty feet tall. Historic photographs, like these taken by George Brayton, c.1923, guide Historic New England as it works to retore this splendid Colonial Revival garden. This article is based on the exhibition Lost Gardens of New England, which reproduces numerous images from the Library and Archives, along with original garden ornaments from the collection. 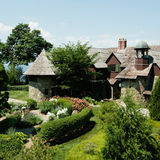 The exhibition will be on view from June 29 to October 31 at the Heritage Museums & Gardens, 67 Grove Street, Sandwich, Massachusetts, www.heritagemuseumsandgardens.org. The text of this article is adapted from the exhibition text by Lorna Condon, Elizabeth Igleheart, and Richard Nylander. Over 280 influential people gathered at the Four Seasons Ballroom in Boston on January 4 for a Gala evening that raised $245,000 in net proceeds towards support of the education and public outreach programs offered by Historic New England. Gala Co-chairs Susan Sloan and Anne Kilguss with President and CEO Carl R. Nold. Trustee Joan Berndt, Board Chair William Hicks, and Ernst Berndt. Boardman House, c.1687, Saugus, Mass. Off the beaten path For an unusual experience, visit Historic New England’s study properties, which are open specific days this season. Ten of the properties are rare building types dating from the First Period of European settlement; most have escaped significant alteration and are left unfurnished in order to showcase their construction methods. The framing and masonry reflect the regional origins of the early settlers, who brought with them building practices they learned in England and adapted to the materials available to them in the New World. In addition to the First Period buildings, other study properties include the Georgian-style Rocky Hill Meeting House in Amesbury, Massachusetts, which remains in pristine condition; the Quincy House in Quincy, Massachusetts, a country house that preserves the history of a prominent Boston family; and the Merwin House in Stockbridge, Massachusetts, a Federal-style house that was updated during the Colonial Revival era as a summer residence. Admission is free to members; please consult your Guide to Historic New England or visit www.HistoricNewEngland.org for details. Nold assumes chair of AAM Historic New England President and CEO Carl R. Nold has been elected chair of the American Association of Museums for the term 2008–2010. The AAM represents more than 15,000 museums of all types and devotes itself to gathering and sharing knowledge on issues of concern to the profession, developing standards and best practices, and advocacy. Nold has been active in the AAM for many years, most recently serving as vice chair. Sacred and Profane Parlor organ, c. 1875. Prescott Organ Co., Concord, New Hampshire. Gift of Susan Foster Vogt. descendants and finally to a family in Haverhill, Massachusetts, who recently donated it to Historic New England. During the second half of the nineteenth century, the parlor organ was nearly as popular in America, at least for a time, as the piano. Few middleclass homes were without one or the other. A parlor organ cost less than half of the price of a piano and took up less space, while satisfying many of the same needs and providing a formidable symbol of culture and refinement. Before Edison’s invention of the phonograph in the late 1870s, the only way to bring music into the home was to perform it. —Nancy Carlisle Curator Visit www.HistoricNewEngland.org to hear a recording of the donor’s mother and sister playing the organ.